Saturday, September 17, 2005. 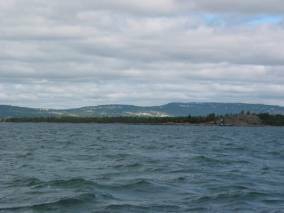 Little Current to Marianne Cove, Baie Fine. While we were docked at Little Current two men were walking along the city dock / wall. One commented to the other, “Wow, this boat has it all. Solar panels, Wind generator, Radar.” The other man said, “Yes, and look, they have an outboard to help them along.” His friend replied, “No, the outboard is actually for the dinghy.” It is so interesting to hear non-boaters’ impressions of cruising boats. 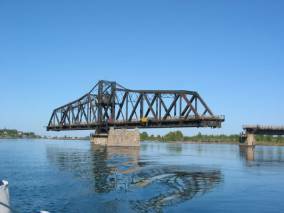 We left Little Current when the bridge opened at 11:00. There was NO wind. The water had a mirror finish. 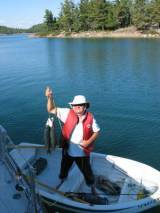 We saw many fish markers on the fish finder/depth sounder, so Brian set out his trolling line. No luck. 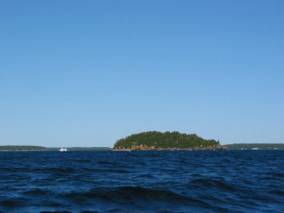 We finally motored into Baie Fine (just as the wind picked up… wouldn’t you know) and arrived at Marianne Cove. While I made up some Nut Brown Ale Bread, Brian went out to try his fishing luck in some reed beds. Forty minutes later he came back with two Northern Pike in tow. 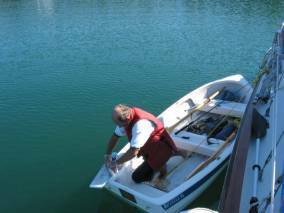 As he was cleaning them in the dinghy, two turkey vultures were circling overhead. They have amazing olfactory senses, but did not stay around for the offering of fish guts. 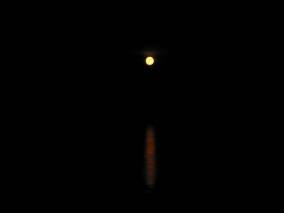 Tonight there was a gorgeous full moon that rose in the east around 8:00. 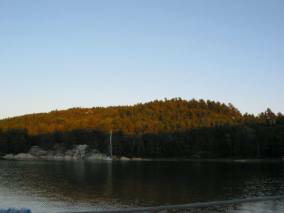 The folks in the small powerboat had already taken their fold-up chairs to shore and cut firewood for a campfire. The other sailboat was in the process of cutting down a small tree to use in their campfire. The folks in the 44-foot catamaran powerboat were watching TV (they have a satellite receiver). 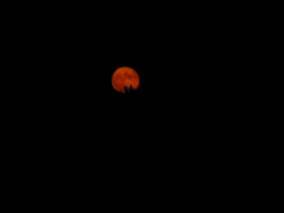 There we were in our cockpit with mosquitoes swarming around the back screens with a glass of wine watching the moon. 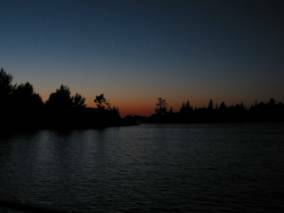 We just do not understand the attraction of going out after dark to light a campfire with the mosquitoes, bears, etc., getting one’s hair and cloths smelling of campfire smoke. 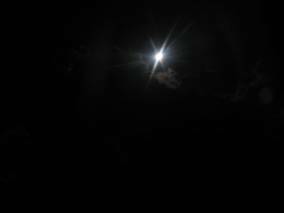 The moonlight was beautiful from our bug-free cockpit. Monday, September 19, 2005. Sung Harbour, Lansdowne Channel. 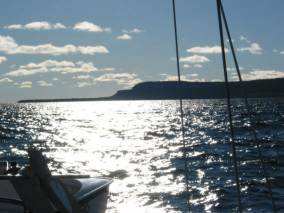 Sunday morning we hauled anchor just before noon and motored out of Baie Fine. There was a 10-15 knot wind from the southwest and veered to the west during the afternoon, so we hoisted the main and had a very fine sail across Fraser Bay to the Landsdowne Channel. Brian put out his trolling line whenever our speed dropped, and we sailed all the way up the Landsdowne Channel to Snug Harbour. There are no other boats in Snug. There are a few Cormorants, and our guardian gull has visited us. We have heard an owl, and the squirrels are making their usual fuss. Monday the wind was 20 knots from the southeast. Since the Bustards are east of Snug Harbour, we decided to say at Snug an extra day and do boat chores. We scrubbed the decks (much needed), and did inspection and repairs on safety gear. The forecast was for gale force winds (35 knots) from the northwest. We felt Snug Harbour was as good a place as any for this onslaught. Tuesday, September 20, 2005. Bustard Islands. We went to bed early Monday night, expecting to be awakened by the wind. Sure enough, at 10:30 we woke to new winds, from the west. They were just moderate … 12 – 15 knots. It was enough to keep Wendy Whirligig (our wind generator) working. We had hoped to catch the boat in its turn from east wind to west, so we could drop the Danforth as a second anchor off the bow. It was too late by the time we got on deck. At midnight we awoke with screaming rigging. 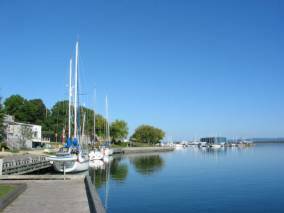 The boat was shuddering with 25 knots of wind and white caps built up in little Snug harbour. Brian decided to stay in the cockpit and try to sleep. I went below and actually slept until 1:30. 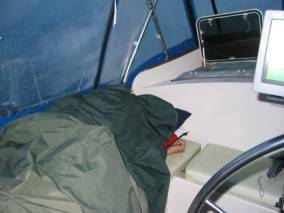 Then I was woken with almost a howl from Wendy and a deep shuddering in the boat. We were measuring gusts in the 30’s up to 37 knots. 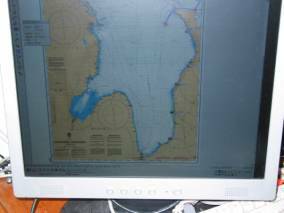 We had set a GPS waypoint when we anchored originally (in west wind) and again when we were in east winds. The original waypoint indicated we were about 150 feet (3 boat-lengths) from our first position; we were sure we were dragging our anchor, ever so slightly. We decided we had to get the Danforth out. The wind was far too strong for us to deploy the dinghy. 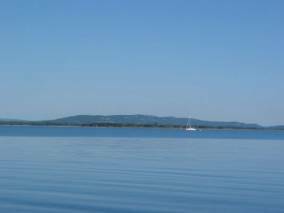 We motored forward and to port, and when we could go no further forward and to port, Brian dropped the anchor. Fortunately it bit (HARD), and there was no more dragging. The Danforth was very difficult to get out this morning and was caked with clay. We stayed up until 3:00 AM to hear the new weather forecast. At 4:00 I decided to go below to attempt sleep. Brian continued watch in the cockpit and got a few minutes of sleep between screaming gusts. We woke up at 8:00 to a relatively benign 15-knot wind and decided the weather was perfect for sailing to the Bustards. 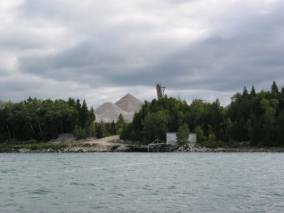 Limestone for Southern Ontario building courtesy of Badgley Island that has just lost its head. 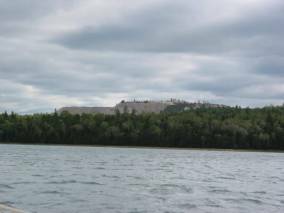 The rock is moved by freighter from here to Midland. 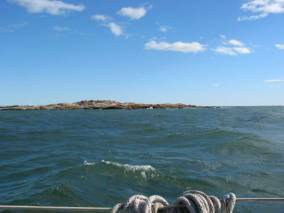 We had an invigorating sail from Snug Harbour to the Bustards (33 miles) under just the mizzen and staysail. The wind in Georgian Bay was still raging at 18-23 knots and the seas were 6-8 feet. We made excellent time, going 6+ knots most of the time. 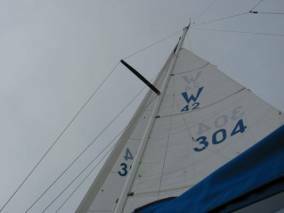 When the wind lulled to 15 knots, we unfurled the Genoa and brought down the staysail. That is when the wind picked back up to 20 knots and suddenly we were surfing down an 8-footer at 8 knots. I was in heaven. 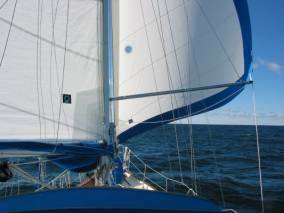 When the boat became too difficult to steer, we furled the Genoa and hoisted the staysail again. Back down to 6.5 knots. As we approached the Bustards the waves became a bit more difficult, especially with a dead downwind run. 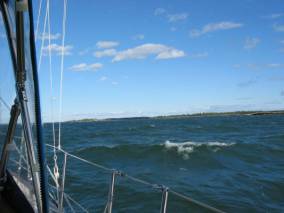 The sea was pretty high, so we ended up sailing down the “Gun barrel” with the mizzen and motor at 6.7 knots! There was not enough room to turn 180 degrees to drop the mizzen, and Brian could not get it down with the strong wind astern, so we kept it up until we rounded Pearl Island (a 180 degree turn to get into the harbour) and then Brian manhandled the sail down as I picked my way through the narrow channel into the anchorage. Thursday, September 22, 2005. Bustard Islands. 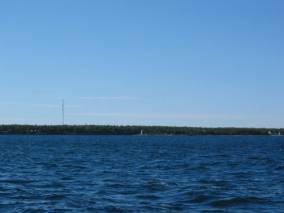 We had hoped to sail to Wingfield Basin on the Bruce Peninsula, just east of Tobermory, giving us a day in Wingfield Basin before making our way down Lake Huron. However, there have been strong southwest winds all day and intermittent rain, so we thought it would be best to wait for the predicted northwest à north winds tomorrow. We had fun yesterday in the dinghy, exploring some channels and bays we have not been down / in before. We saw our first raccoon of the trip, a very large, fat animal who scampered across the rocks when it saw us and hid in a crevice staring out at us as we rowed past. I guess the cottages here (3 of them) keep him going through the summer; he must be able to swim (I never thought of raccoons swimming) between the islands. Friday, September 23, 2005. 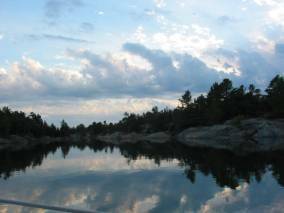 Wingfield Basin, Bruce Peninsula. The north winds blew at 15-20 knots last night in the Bustards, interrupting our sleep somewhat. We woke up at 6:00 and left the Bustards at 7:15 with the north wind (and seas). This was the first day I wore a sweater all day since we set out from Midland in June. In the middle of Georgian Bay it was 56 degrees F. Even when we got into Wingfield Basin, the air was 65 degrees and the water a chilly 61 degrees. 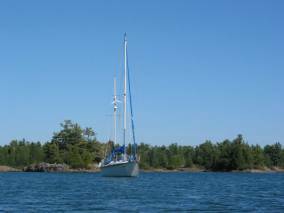 We had a great sail for the first half of our 40 nautical mile voyage down the length of Georgian Bay. With the main and Genoa we were trucking along at 6.5 knots on a broad reach first, then we poled out the Genoa and went wing-on-wing (to Wingfield Basin) on a dead run with 3-4 foot seas running with us. At noon the wind lessened to 7-11 knots, but the waves did not decrease, so we motor-sailed the remainder of the way to ensure we got into the harbour by 4:00 this afternoon. 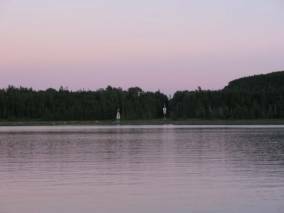 With the sun setting at 7:00, we want get to our harbours early, especially this one that has a buoyed and range-marked channel that is quite narrow. 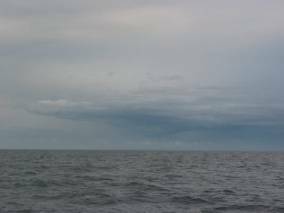 It was tricky getting through the channel with the north wind seas … as bad a threading a tiny-eyed needle with a thick thread. § We are now in the “delivery” phase of our cruise, delivering Pilgrim back to Lake Ontario. 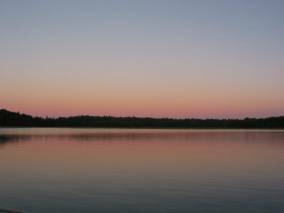 The alarm clock will go off early for the next few days until we are in Lake Ontario. 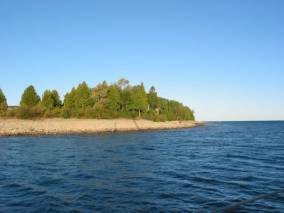 We want to get an early start tomorrow so that we can get through the tricky passage around Tobermory (Devils Island Passage) into Lake Huron before noon. Then we can settle in for the long trip south to Sarnia overnight. The north wind is cold. The south wind is warm. Overnight at Wingfield Basin, the wind veered from north to east and then southeast. 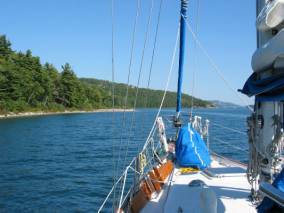 The long underwear and sweaters were quickly shed as we sailed in the sun with the 15-knot southeast wind at our back from Wingfield Basin to Devil’s Island Passage, just north of Tobermory, the main passage from Georgian Bay to Lake Huron. We made the 3-hour trip easily. Then the fun ended. 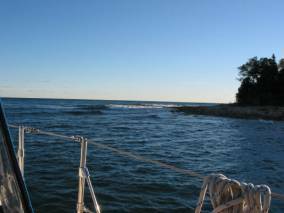 As we entered Lake Huron, the waves that had been building all night up the lake hit us full force. They were 4-6 feet and “confused.” They did not know who was commanding them, and hit us from several directions. 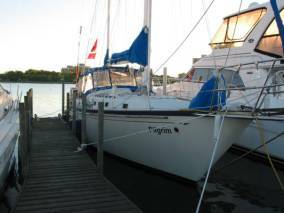 We hauled in the sheets and sailed as close to the wind as Pilgrim will allow. Dinner was a bit of a challenge, but thankfully I had made extra vegetable/ bean/ beef soup in the Bustards and had cornbread left over as well. We ate in the cockpit, as usual, and spilled soup under the cockpit grating despite filling our bowls only half full. We decided it was prudent to put a reef in the main, since the forecast was for continued 15-knot wind from the south veering to southwest. The seas were so large; we did not think we could plow through them with the shortened sail, so we motor-sailed without a Genoa. Since it was dark by 8:00, we started our watches then and decided I would take the first watch until midnight, then Brian would take a half watch until 2:00, I would take a half watch until 4:00 and then Brian would take the final watch until 8:00 AM. Great plan, but by 10:30 the boat was groaning and slamming into the waves so badly that our speed was cut down to 2.5 – 3 knots (usual cruising speed for us is 5-6.5 knots). As well, we were not going toward Sarnia, but headed for Kincardine, halfway up the Ontario Huron shore. We both stayed in the cockpit and while one kept watch, the other catnapped. This worked much better than we anticipated. We both felt quite refreshed even after only 15-20 minutes of rest and sleep. 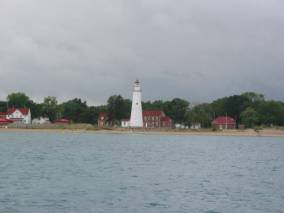 At daybreak (7:00) on Sunday we decided to tack and sail for the Michigan shore since the forecast was for winds from the southwest. We thought this would position us well, and the waves would be smaller. 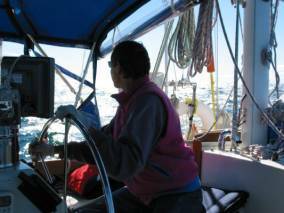 We shook out the reef in the main and unfurled the Genoa and were making much better progress than when we were motor sailing. At noon the wind began to die, and the overcast sky began to look ugly. Scattered thunderstorms were in the forecast. 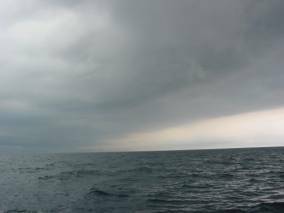 We turned on the radar (we were in shipping lanes and the visibility was not good) and began monitoring thunderstorms approaching us. We tried to outrun several, and were successful a few times, but were hit with pretty violent thunder, lightening and rain in three separate thunderstorm cells. The wind during the storms gusted to 30 knots, but between storms the wind died to nothing. What sails should you keep up under such circumstances? 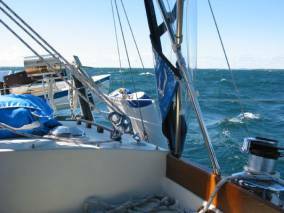 We were cautious, and reefed the main and furled the Genoa when the storms hit. However, for 2 hours (2:00 to 4:00) we made little progress towards Sarnia. The hoped-for southwest winds never materialized; the winds had veered a bit more south. That, along with the thunderstorms, caused the seas to continue to be very large and confused. 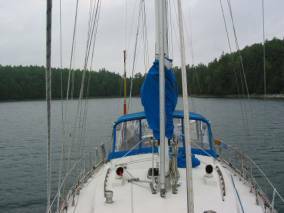 They really slowed us down, but we found that sailing with the reefed main and the Genoa that could be furled to the appropriate size relatively easily (sometimes Brian did not find it so easy, however) gave us better progress than using the motor. 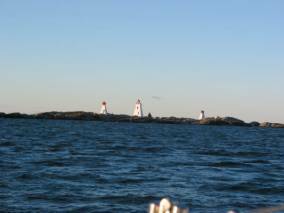 We tacked and headed toward the Canadian shore. 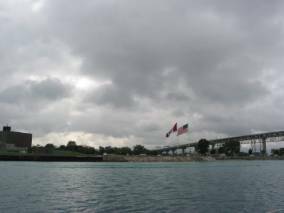 We were too far west to be able to make port at Goderich before dark, so headed toward Grand Bend. Although both of us tried to sleep during the day on Sunday, with the sudden changes in the weather, the thunderstorms, and the rain, torrential at times, it was impossible to sleep. Sunday night (our second successive night out), we decided to stay in the cockpit together and catnap. 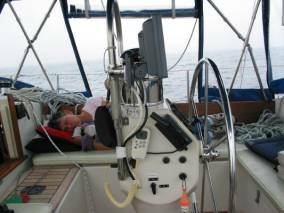 The boat was slamming into the waves so hard; it was impossible to relax enough to sleep. The rain was so heavy at times the scuppers were overflowing and gurgling. We discovered new leaks in hatches, portholes, and through one of our chainplates. The full enclosure got so soaked it began to drip. Everything was wet. The folds in the reefed main along the boom filled with water. The ropes were saturated. When we opened the enclosure to check for freighters, we often got a face-full of water, either from the rain or from the spray off waves. Things we thought were well-stowed below went flying. Brian found one of his drills under the engine when we got to Sarnia! Our garbage container is a bin that hinges from the bottom. On one particularly hard slam down a wave, it flew open and dumped half its contents on the wet floor. 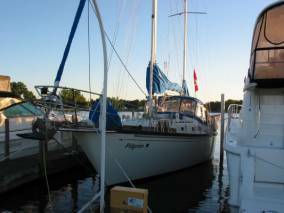 We finally got close to Grand Bend a bit after midnight and tacked toward Sarnia. The wind had now shifted to southwest, and for some reason, Pilgrim refused to sail into the wind. 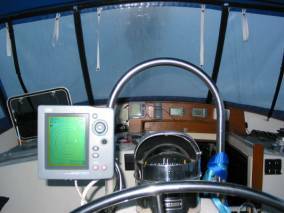 It was so dark and wet, it was hard to discover what the problem was: Too little headsail? Sails trimmed in too tight? Too much water in the mainsail making it too heavy? Waves that kept pushing the bow off the wind? Our progress for the last 30 miles was slow and discouraging. Pilgrim seemed intent on being stubborn (The Mule) and refusing to respond to my coaxing. Port tack was bad; starboard tack was worse. Finally at 4:00 we decided to heave-to and wait for the northwest wind. We tried 4 times to bring the boat around into a heave-to position, but failed to get the bow pointed in the right direction and the boat drifting with the wind. After an hour, we gave up and kept slugging ahead. 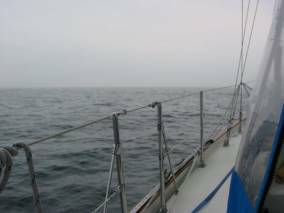 At daybreak the waves and wind had lessened, and we decided to furl the Genoa and motor sail with the reefed main for the last 15 miles. 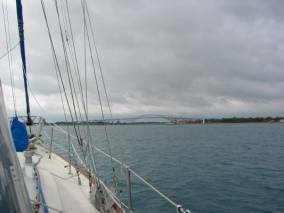 At 10:00 we entered the channel for the Bluewater Bridge at Sarnia. When we finally were close to the bridge, the strong current took hold and the GSP showed we were traveling 8 knots! Although exhausted, the end was in sight. 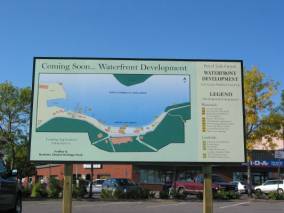 We called Sarnia Bay Marina. They said they could accommodate us (42 foot sailboat with 13.5 foot beam and 5.5 foot depth) and gave us a slip assignment over the radio. We managed to get in the buoyed channel and found the slip. An attendant was waiting to catch our lines. As we positioned Pilgrim for final entry into the slip, I gasped. There was a huge powerboat sharing the slip and barely 15 feet remaining for us. There is a plastic piling that separates the two boats. There is not enough room for us to have fenders on the dock-side of our boat and a fenderboard keeping us off the piling. Luckily, the piling is plastic and our steel-plated rubrail seems to be doing more damage to the piling than it is to us. How I managed to get Pilgrim into the tight space without touching the dock, the piling or the other boat is pure luck (and favourable wind). During the storms we thought something major on Pilgrim would break. We were fortunate. The dinghy did not fill with water and bend the davits (as happened last summer). The solar panels were not damaged. We did not loose a mast or a sail. We did not loose an anchor. So far, we have found that one of the bow lines that we keep on the bow pulpit had washed off and twisted around the bobstay. (We purposely keep them shorter than the length to the propeller to ensure that if they do go overboard, they do not wrap around the prop) The cotter pin holding the clevis pin for the forestay/ furler is mangled, but did not give way. One cup holder in the cockpit was broken. We said this was to be a shake-down cruise … to ensure the boat and we were ready to do extended cruising on blue water. We have been too prudent to go out in rough weather. In some ways, the last two days gave us experience we needed, but were not willing to “seek out.” We learned much about ourselves, our relationship and our boat. 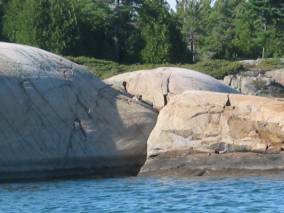 The “end” of our Great Lakes shakedown … or was it? The lakes were not finished with us yet!